100% American Made with American Steel by proud American labor. Offers high quality pre-fabricated steel structures designed for simple, fast, do-it-yourself assembly. Cutting edge factory technologies, superior design, and only the highest grade materials yield the strongest and most durable building on the market today. We are a Better Business Bureau Accredited Business and honor our commitment to uphold our accreditation standards and our commitment to ethical business practices! We guarantee 100% honesty and accuracy on every order! ALL of our buildings are Proudly 100% Made in America! They hide this fact because their buildings are not made to our high manufacturing standards! Steel Factory Mfg offers unsurpassed experience and integrity that only experienced building professionals can offer. And all at the lowest price guaranteed! You'll be glad you did. 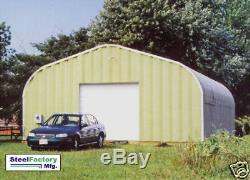 20' wide x 30' long x 12' high P-Series'Pitched Roof' Style Arch Building. Includes choice of color for arches and endwalls. Roof Slope: 4:12 pitch Profile: Gable. Rugged 100% American Made 22 gauge Galvalume Steel. All necessary nuts, bolts, washers, and hardware included. 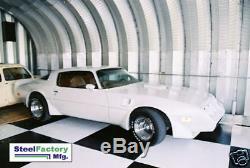 Detailed Manuals and Factory Engineering Included. Engineered to withstand 95 lb ground snow load and 169 mph sustained wind speeds! Actual size and options may vary. Please refer to details in listing for building for specs. Door opening sizes can be changed. Don't Be Fooled by lower quality look-alikes! 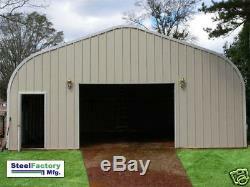 Heavy Duty Commercial GALVALUME Coated Steel. Galvalume Steel - Build Green! Our Energy Star rated Galvalume steel saves you energy costs! EPA standards require that a roofing material must have an initial reflectance greater than or equal to 0.65 and maintain a reflectance of greater than or equal to 0.50 after 3 years weathering on a roof. Our high quality 100% American Made Galvalume maintained an average of 0.78 initial reflectivity and 0.58 weathered reflectivity. All results are well above EPA Energy Star standards for energy efficient roofing materials. Better heat reflectivity means lower energy costs! Seven Times Our panel overlap is double industry standard! Two simple concrete bases that are used for all Steel Factory Mfg buildings are easy and inexpensive to install. We even provide the manual and prints! Quick Simple Assembly in 4 Easy Steps! Just follow our step by step instructions! Step 1: Pour a simple floating foundation. Step 2: Bolt arches together on the ground. Step 3: Raise the arches into place. Step 4: Install doors and end walls. Don't see exactly what you're looking for? Certified Drivers : All drivers who haul for our factory must pass our certification course prior to delivering any of our products to our customers. We do this to ensure your building package arrives at your job site the same way it left our factory, in perfect condition. We guarantee your building will arrive safe and without damage. It will be the customer's responsibility to offload the truck on arrival. Engineering and manuals are sent out within three to four days. We can manufacture almost any size and configuration! Steel Factory Mfg - 7491 N. Federal Hwy Ste C5-315, Boca Raton, FL 33487. The item "Steel Factory Prefab P20x30x12 COLOR PANELS Metal Garage Workshop Building Kit" is in sale since Friday, December 21, 2018. This item is in the category "Business & Industrial\Building Materials & Supplies\Modular & Pre-Fabricated Buildings". 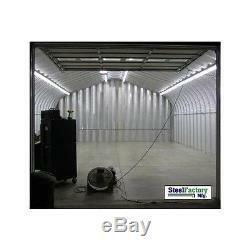 The seller is "valuesteel" and is located in McKees Rocks, Pennsylvania.